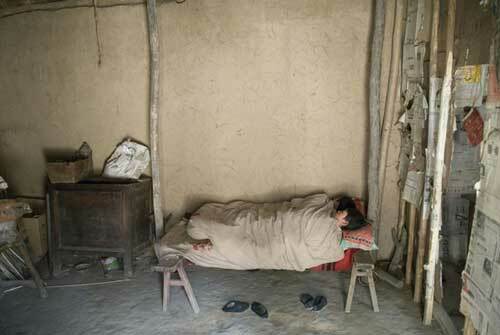 Gilles Sabrié, photographer, is based in Beijing since spring 2006. Gilles Sabrié first worked for television in France and in United States. Based in New-York, he then became consultant, specialized in television channels creation, programming and promotion. At the same time, he carried on his work as a documentary photographer. 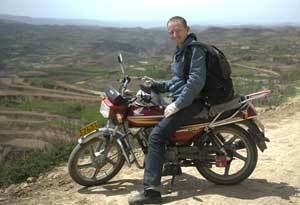 He travelled almost everywhere in the world, most specifically in China, India and South Africa. His photos have been published in various newspapers and magazines, such as Newsweek, Time, US News, The New-York Times, L’Express, Focus, Le Point, Libération, Courrier International. In 2005, he decided to leave television and to dedicate his time to his passion, photography. Fascinated by China, he settled in Beijing in early 2006. Among his most recent essays : 175 M, or the Three Gorges Dam, The Mingong, Traveling Opera, Faces in Beijing Subway. The DVD of the multimedia projection is also for sale: RMB 100. 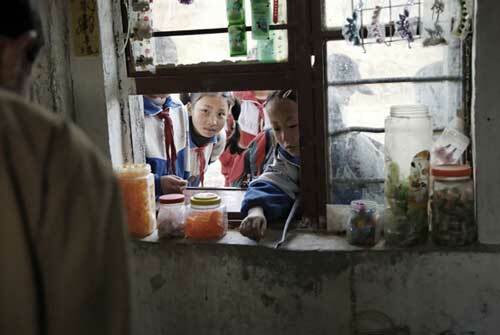 In April 2007, Gilles Sabrié went to Gansu and Shaanxi to meet the children taken care of by the Assocation. He travelled deep in the mountains, in some of the most remote villages, where outcasts of chinese economic miracle live. ” The memory I keep is the one of this little girl, whose look was not the carefree one of a child, but the grave one of an adult whose life has been tough “. 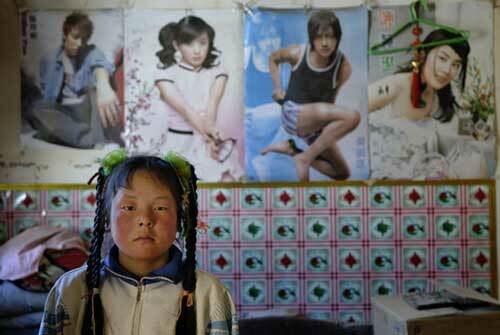 The little girl, Tan Xiaofang is 10 years old. Her father is mentally handicapped and her mother left them. 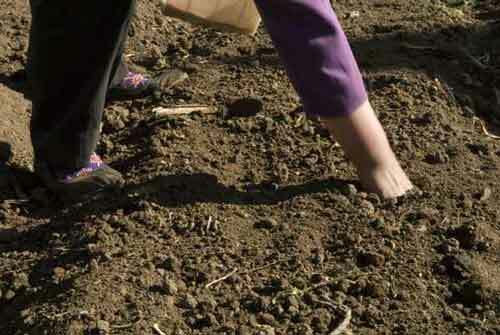 She lives with her grand-father, almost blind and deaf, and her grand-mother, in the village of Shanmen. 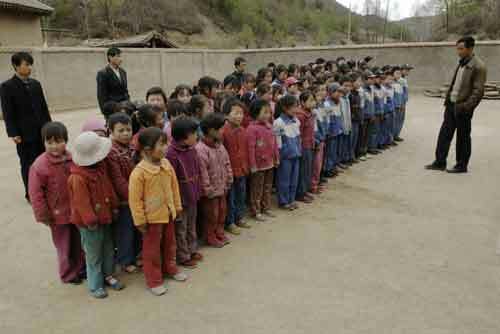 ” There was also this teacher, who couldn’t get his diploma because of the cultural revolution and was working very hard for 150 yuan per month”. The teacher, Lei Shi Xiang, has been in Guanshan primary school for 25 years. 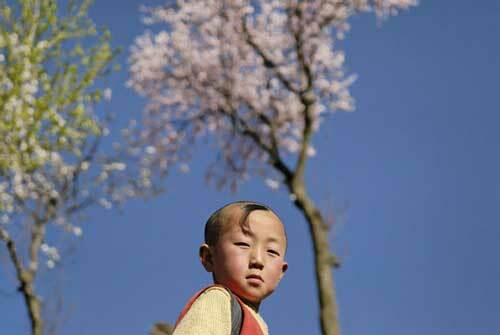 He is thinking of leaving the school to try to find a job as a migrant worker in a big city. All these touching memories have been caught with a lot of grace and sensibility by Gilles Sabrié’s camera. G. At school The cracked hands are a sign of poor nutrition and in particular lack of vitamins. H. Lei Shui Xiang, school teacher Lei Shui Xiang, headmaster of Guan Shan (Gansu) primary school. 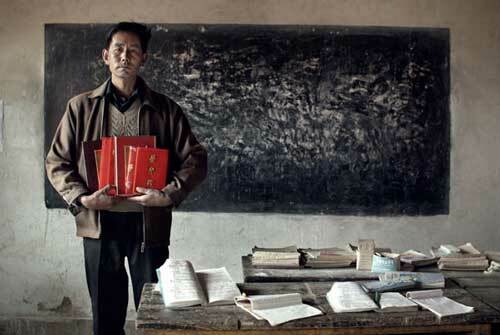 Devoted to the children, covered with academic honors, his monthly income of RMB 150 hasn’t changed in 25 years, in spite of repeated request to have his status changed.. I. The pupils of Guanshan school The children of Guan Shan school. 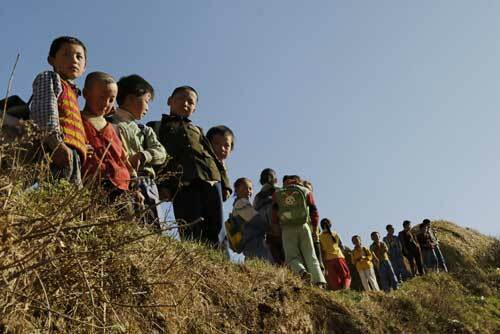 Most of these peasant’s kids live a few hours walk from the school. J. 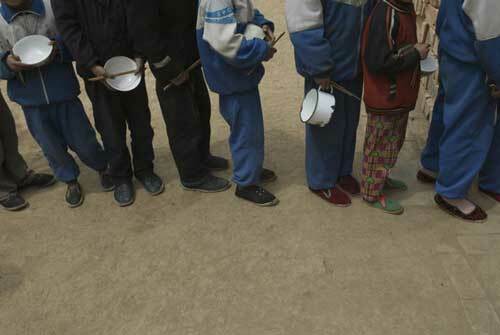 The children of Guanshan school The children of Guan Shan school standing in line to get their lunch. They eat noodles, for breakfast, lunch and dinner. The school budget doesn’t allow for anything else. 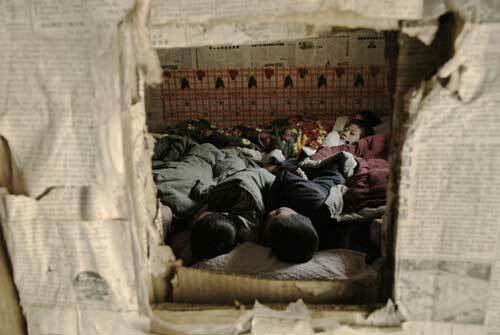 K. Schoolboys of Guanshan Schoolboys of Guan Shan at naptime in their makeshift dorm: a room rented from a local farmer. L. At naptime At naptime two boys are sharing a makeshift bed in a room rented from a local farmer. The school has no budget for decent dorms. M. The schoolgirls of Guanshan The schoolgirls of Guan Shan taking a nap in a makeshift dormitory. They only come back home at the week-end. O. Tan Xiaofang Tan Xiaofang (11 years old) with her blind grand-father. 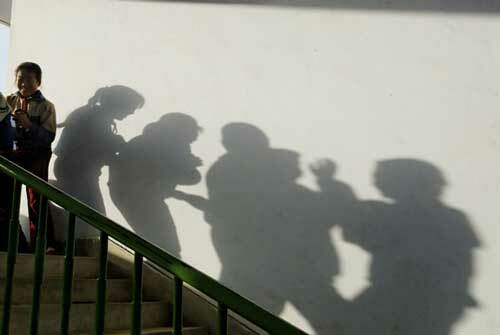 Xiao Fang mother left the family after her husband fell mentally ill. The grand-mother his left alone to support the family. Xiao Fang grand-father died a few weeks after this photo was taken. P. Gao Xiahong Gao Xiao Hong, 15 years old. When she was 7, her mother died of heart disease. 4 years later her father fell ill with cancer. She now lives at her uncle’s who supports 7 people. Q. After school, Gao Xiaohong After school, Gao Xiao Hong is sweeping the floor at her uncle’s.